I need to spread things out a bit instead so I do not get too exhausted. I also need to vary up some of the training so it doesn’t get stale. This time around I will be doing a 4/1 week cycle so I can build longer but more slowly between recovery weeks. I did not run enough. Aside from everything, the run being the final leg means that I need to put in more miles in my Brooks. I was not fast enough in the bike and the run. I was in the middle of the pack in my swim but bottom in the other two. While I can run more, biking much more is unlikely so I need to incorporate other things into training to strengthen my legs. I need to be stronger all around. This time, I plan to build in Insanity and P90X workouts into training to help with that issue. I am also spreading out my weight workouts over two weeks and five sessions. This way I can isolate body parts more over the course of the 20 weeks. I need to get much, MUCH better in the transitions. I was literally last in the bike to run transition and close to it from swim to bike. Mainly because I didn’t know what I was doing. It was also hard to transition my legs to the new activity in the bike to the run. To fix this I have built in brick workouts (Bike to Run) at the end of every 4 week cycle. This increases each time to almost 80% of the actual distance 2 weeks before the race. I definitely need to be lighter. Every pound lost is one I do not have to carry with me. I managed to gain back 15 of the 20 pounds from the last race so my work is cut out for me but my goal is to be under 170 by May 1st. That will be close to a pound a week and 5 pounds less than the Olympic but I know I can do it. The big thing will be figuring out how to keep the weight off this time around. While this seems daunting, I am in a much better place than December 2012 when I started training for the first Wildflower. 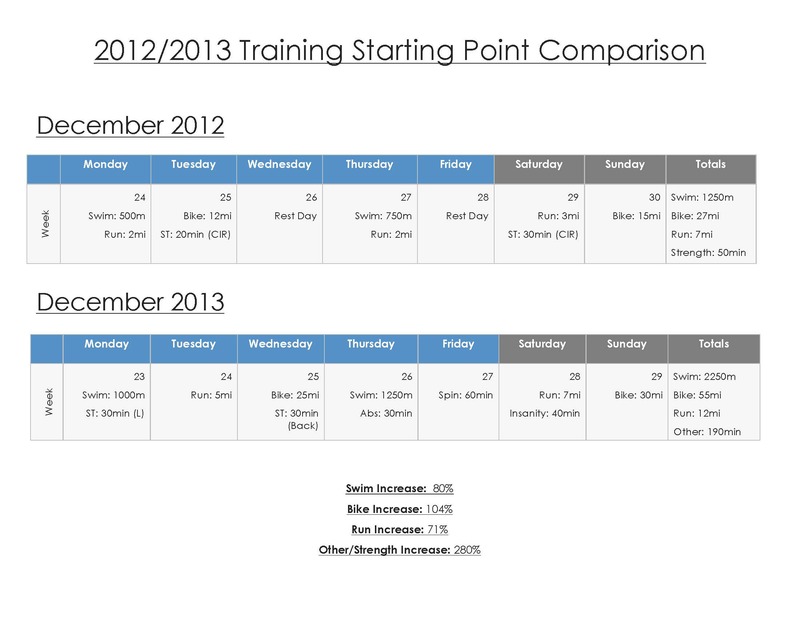 You can see the difference in the weeks in the following picture, a much better baseline from which to start. With I year of training under my belt, I am positive that this plan will work well for me. Though I do need to remain flexible because an 8-12 month old will throw a wrench in the plan pretty regularly. Even when she sleeps well I mess myself up by leaving the car in the garage instead of the driveway. It will be little things like that plus some travel and a unpredictable work schedule that will make things interesting but one way or another a half-ironman will be run. The really fun part is that the race is on Samantha’s birthday and those of you who read this blog know that Sam was born 2 days before the race last year (You can read that post here). This means that regardless of USAT rules and regulations, Sam will be accompanying me across the finish line. They can disqualify me if they want. Below is the plan. 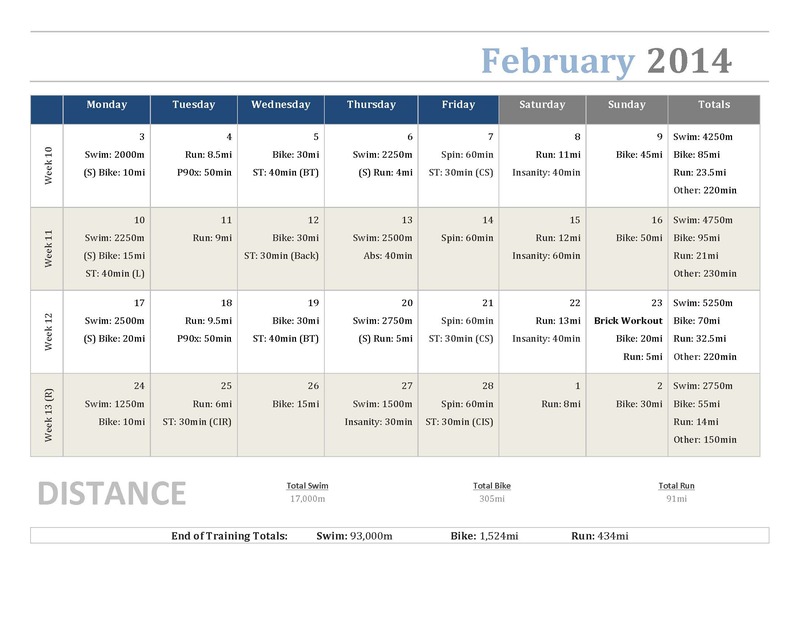 Set up in 4/1 cycles with two, 2 week intervals, followed by 2 weeks of peak and weeks of taper. In the mix are a Spartan Sprint, a Spartan Super, and the D.C Half Marathon. 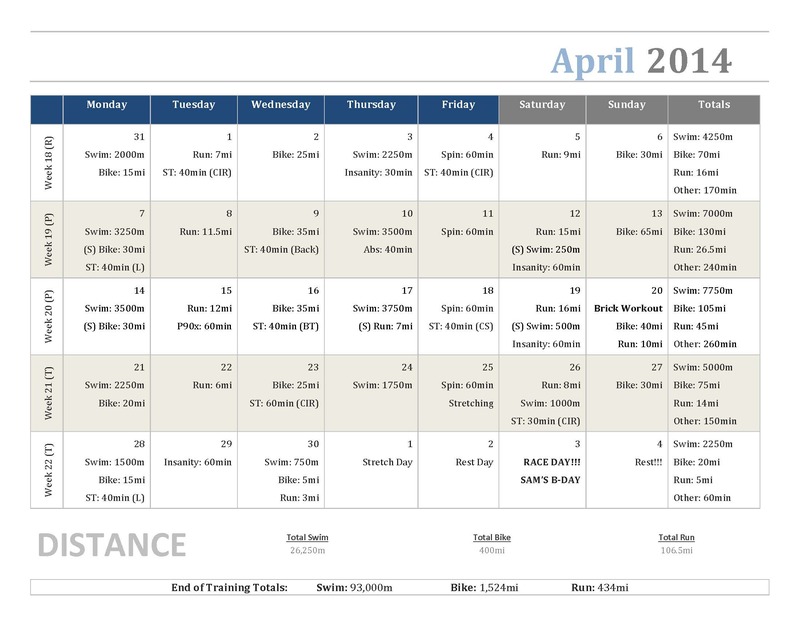 NASPA week will be a mess and this year it is not a recovery week so we will play that one by ear, good thing it starts with Half Marathon. 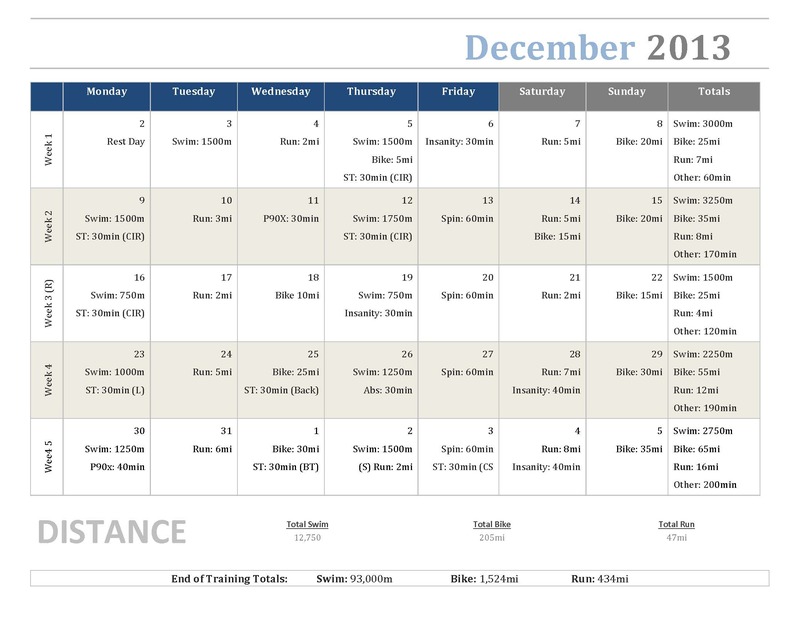 I’ve also spread out all the different activities across the 2 week intervals but build faster with each week. Overall, the increases from last year to this year are: Swim 20% more, Bike 14% more, and Run 70% more. The big change is the increase and isolation in strength training plus a bunch of other workouts. These include weekly Insanity workouts plus P90X and abdominal workouts every other week. I’ve also added a spin class each Friday to help with speedwork though I have to increase the intensity far beyond what the instructor does. The age and fitness levels are kind of out of sync. Well, that’s the story, we will see how it all pans out over the next few weeks. 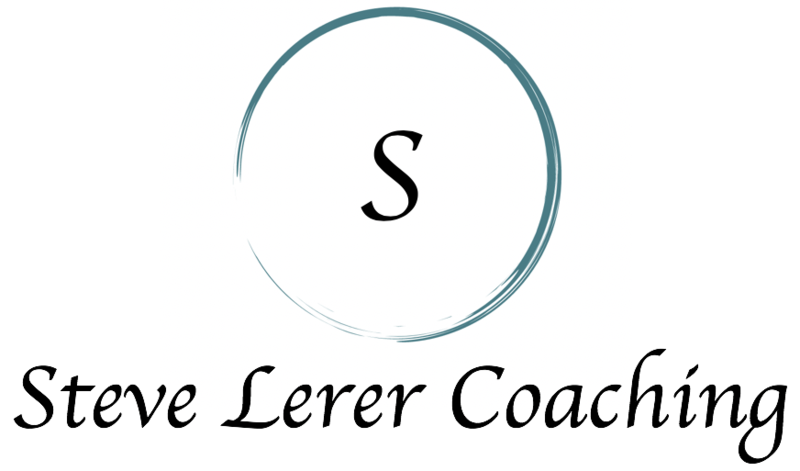 Take a look below at the plan and let me know what you think. 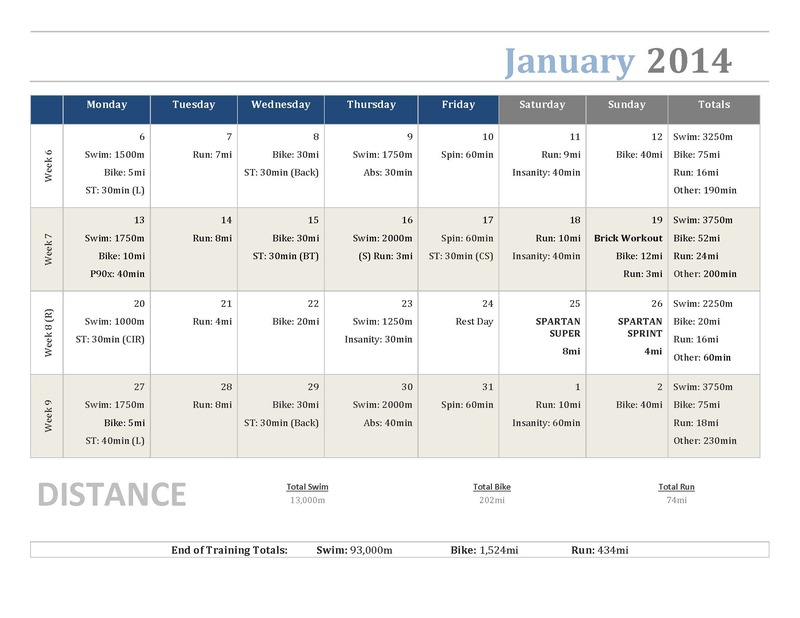 Wow, I totally swiped those training schedules–I am not sure if I can start running again in time, but eventually I would like to do an Olympic this or next year (I’m older and heavier than you)==but I need goals to lose weight, apparently. Thanks for sharing. . . what is the program you’re using to put these on a calendar? I have seen other folks use this too, and I really like it! I find it a little difficult to lose weight while training for triathlons because I’m just so damn hungry all the time. I wrote a post about this. Anyway, I just modified a calendar in word, it’s labor intensive but I like the result. Hey there, great to see such organisation, now the hard part is doing all of what you have planned! What sort of time are you hoping to achieve at the Wildflower? It sounds good but with a young baby who knows. My wife was pregnant for WF 2013 training so that was easy but the baby was here for the Pacific Grove and I missed a lot so with her going from 8months to 12 months during this plan we shall see. I am just hoping to finish below 6 hours. 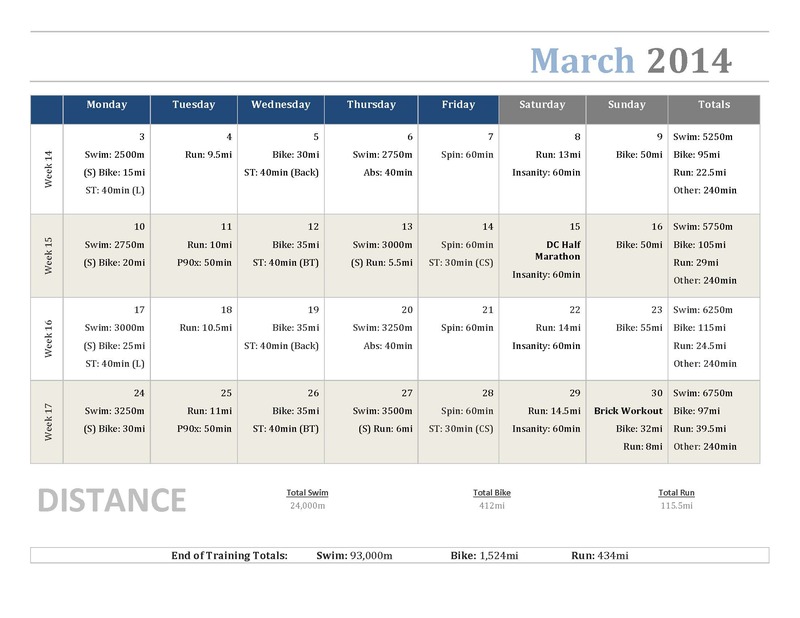 It is my first Half-Ironman distance so I am not too ambitious. I love doing the Half Ironman distance. To me, it is the ideal test of anyone’s endurance, and this is coming from a person was has done a full Ironman and even placed. I love the Half Iron distance and it is a total rush to cross that Finish Line. And while I see a lot of cardio in your program, I don’t see any weight lifting. I am a certified trainer with ACSM and I still hold that the “theory of the specificity of exercise” is just that-a theory. I don’t do any swim training, (call me crazy) but I am lifting weights sometimes 3 days a week because this is a test of strength, really, and I always finish because I am strong enough to gut it out those last few miles. I did the Florida Half Iron in May on 17 days of training and I still finished because I just have the base of a bodybuilding triathlete and it has worked for me through my decade of Half Ironmans! Okay, you can call me a genetic freak, but I still say hit the gym and build some strong legs for this distance.Merry Christmas, too! Thanks for the feedback. The plan actually has bike/run bricks in it. 4 in total increasing proportionately over time. They happen the day before the recovery week starts in the 4/1 cycle. Also thanks for the article, if that would happen I would be very sad. I saw the bike/run bricks on your plan, but I was suggesting bricks where you run first then bike. Oh that makes sense, thanks!